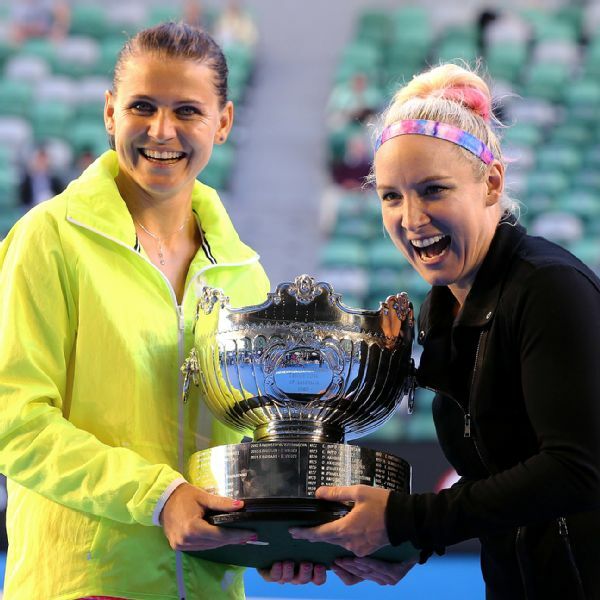 MELBOURNE, Australia — American Bethanie Mattek-Sands and Lucie Safarova of the Czech Republic won the Australian Open women’s doubles title in their first tournament as a combination, beating Yung-Jan Chan of Taiwan and China’s Jie Zheng 6-4, 7-6 (5) in Friday’s final. Chan and Zheng twice served for the second set. Mattek-Sands clinched the match with a backhand to the open court in the tiebreaker. It marked the first time a new pairing has won a Grand Slam title since Nathalie Dechy of France and Russia’s Dinara Safina took the 2007 US Open title. Mattek-Sands, a 29-year-old from Minnesota known for her adventurous tennis outfits and multi-hued hair, was out for six months last year while recovering from hip surgery and wasn’t sure she would play doubles at Melbourne Park. The two came together in the offseason because Safarova’s coach is friends with Mattek-Sands’ husband, Justin. It’s the first Grand Slam trophy for the Czech player. Mattek-Sands, who received treatment on her right hamstring several times during the match, won the 2012 Australian Open mixed doubles title with Horia Tecau of Romania. The match started about 4:30 p.m. locally, just after midnight on the East Coast of the United States, and finished well into the overnight hours. Asked whether they were dancing in the streets of her hometown of Neenah, Wisconsin, Mattek-Sands said she wasn’t sure. In a mixed-doubles semifinal, Leander Paes and Martina Hingis emerged victorious with a 7-5, 6-4 win over Hsieh Su-wei of Taiwan and Pablo Cuevas of Uruguay. But it was more notable for an incredible behind-the-back volley by Paes that will likely go down as one of the shots of the tournament. The Indian player’s shot came in the eighth game when he and Hingis were in the latter stages of a 21-shot rally. Hsieh hit a ball to the left of Paes, who was standing near the net, and it seemed destined to be a winner. But the right-handed Paes flicked his racket behind his back and somehow kept a volley in play during a point that he won with his subsequent shot to level the opening set at 4-4.